Latitude the data section accepts geographic latitude points. Longitude the data section accepts geographic longitude points. Value the data section accepts values related to geographic points. Alle buttons for customizing the dashboard item are on the Design tab. Dashboard ships with a set of default maps showing various parts of the world. The following maps are included. World Countries - a world map. Europe - a map of Europe. Asia - a map of Asia. North America - a map of North America. South America - a map of South America. Africa - a map of Africa. USA - a map of the USA. Canada - a map of Canada. Dashboard uses a Shapefile vector format to provide custom maps. Commonly, this format includes two file types. 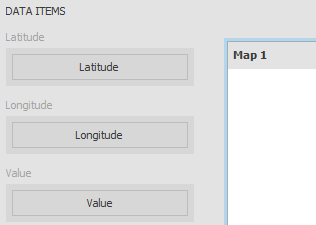 To open an existing shapefile, use the Load Map or Import Map button in the Ribbon. In the invoked dialog, locate the required .shp file. When filtering is enabled, an end-user can click a callout (or multiple a callouts by holding down the CTRL key) to make other dashboard items display only data related to selected a callout(s). Geo point map - InLoox • Copyright 1999-2019 © InLoox, Inc. All rights reserved.